I used to laugh (at least on the inside) when people met online. I didn’t understand how real connections could be formed like that. I’m sorry I laughed, even if nobody actually heard me. I’m sorry I doubted the authenticity of the relationship just because it deepened through emails and Facebook messages. My perception changed because some of the best encouragement in my life comes through emails, texts, Voxes, Facebook messages, tweets, and comments on my blog post. These friends of mine have prayed for me. They’ve promoted my ebook and sent real cards and gifts to my front porch. We may have met online, but they’ve shown up in real life – even if there are still some of them I’ve yet to meet in person. These friendships are the beauty of technology. I like Facebook for how it connects. I like my iPhone for how it makes the world a smaller place. Emails are like ongoing conversations with people I wish could be my neighbor. Plus technology helps maintain connections with people who used to live near and even those who still do. Thankfully, I’ve got some amazing real-life friends who can actually come around my table to share meals and lives. I’d be lost without them. That’s why I didn’t think I needed to make friends online too. But this new community I’ve found goes beyond pixels and font size. They’re another layer of encouragement to not grow weary in life and inspiration to continue telling my story. They pray for the people, sicknesses, conflicts, hurts, and decisions that are part of my real life. They praise God when healing comes and love is shown in my everyday life. Just the other day my husband and I – who met long before we even had cells phones – were talking about how sometimes real life is hard. During those times, the prayers of people who aren’t right in the middle of the everyday-ness are blessings. My family went with me to meet one of my favorite online encouragers when we were in Texas a little more than a year ago. I think they all thought I was a little crazy for wanting to go spend time with someone I’d never met in person. But they – and me! – have realized the in-person meetings can certainly happen after the friendship is already developed. In March 2014, I spent the whole weekend with writer friends from what started as an online book launch group. Then my family and I met another favorite online friend of mine when we were in Chicago last spring. That time together wasn’t awkward like you may think it could be. In fact, it took our friendship to a deeper level – as did my other in-person meetings with online friends. I have plans to meet up with a group of my blogging friends this summer. 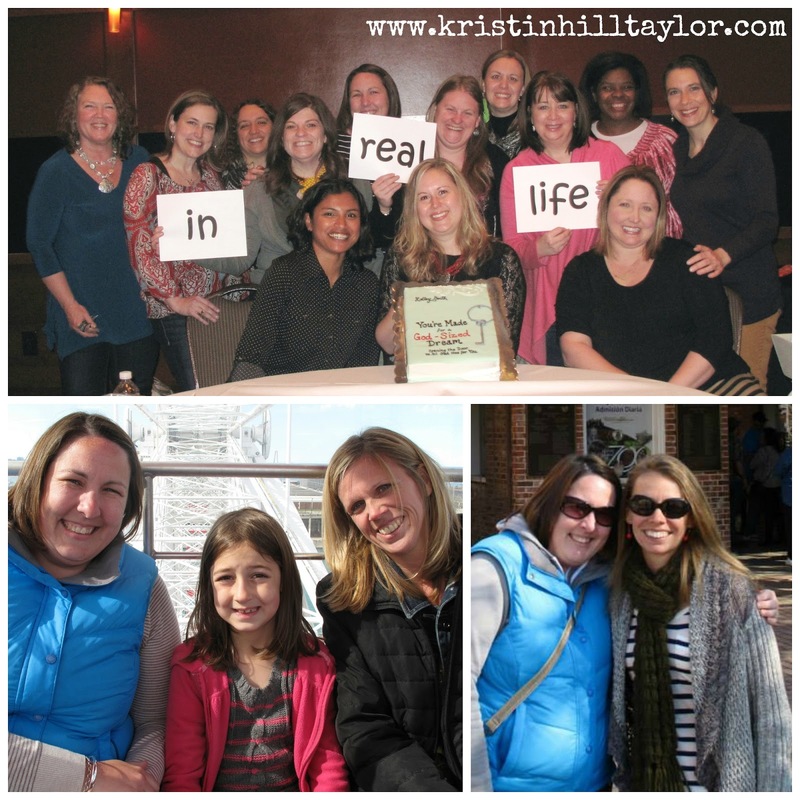 Yes, we connected through blogging, but our friendships go beyond that now. I may have met all these folks and others online, but they’re real friends. They make me grateful I didn’t remain stubborn, laughing at the idea people could meet while sitting at their own computers. These blessings came when I decided to open up my life to community online, thanks to technology at its finest. I'm linking up this post with The High Calling, where others are sharing their technology stories, and Lyli Dunbar's Thought-Provoking Thursday. My husband and I met online, long before it was popular! He wanted my phone number and I wouldn't give it to him for weeks. Back then, it was a landline. We finally met in person about a month after talking on the (landline) phone and once I met his real life brother and sister in law, and saw that they were normal as well, I decided that I was safe. Oh my how times have changed, haha! You're one of my favorite blessings from this big 'ole internet. So grateful for the technology that connects and helps us plan the next real-life meeting! Love you! How fun! I have a brother-in-law and cousin-in-law who met their spouses online too. Thanks for sharing your story here, Mary! Love you, friend. One day I will click my ruby shoes together and bring you Florida. I love this post - especially the pictures. Inspiring! I am coming to understand more and more of what you mean about the depth of community that can be formed online. It's a real blessing to me.Thanks for being one of those I count as a new friend! Delighted to come over and visit you from Front Porch. Last week my heart was stirred as I was praying for all the new God connections that were being made in my life, many of which were online with other bloggers. I was marveling over the WORD come to life that when each member of the body is in place and operating as designed, there is no schism in the body. I thank him for uniting members of the body near and far. I thank I'm for spirits that connect and soar together and I am grateful new friend for our connection. Grace and mercy multiplied to you today. Kristin - I LOVE this! My post I just linked up with is something similar and just confirms to my heart how important these blog friendships can be and how God can use them to indeed bless us and encourage our hearts. Praise God for answering our need for community and soul sisters and dream encourages, both in real life relationships and those forged online! I have been blessed by a similar experience. Women whose paths I would have never crossed had it not been for our blogs have now become friends who truly know me. Who I text and email regularly as we exchange silly daily happenings and gritty prayer requests. Yes, online relationships are real! And I'm so thankful for the gift of technology that make them possible. Thanks, Mindy! I'll have to go read your post soon. Happy Friday! It's certainly been a lovely surprise in my life! Thanks for being here, Becky! Yes! Thanks for being here, Dolly! We can never get too many Godly friends who will pray and encourage us for we never run out of trials. I am hoping to meet up with a blog friend in March to meet another blog friend. I look forward to reading on a daily bases several bloggers. Sweet post. I'm so glad you have those friendships and encouragement too, Betty! Just now able to officially link up - my wireless keyboard and mouse had to be replaced but I am up and running again. Oh Kristin! I love this. I have been so blessed by the online relationships I've made in my seven years of blogging. I had no idea that these relationships could be so strong. But Jesus' can use any means to connect His people -- including Facebook, Twitter, blogs, and more. Those relationships, though, are always enriched when we have the opportunity to see one another face to face. I'm glad to read about the many face-to-face interactions you've had with friends you met online. And that cake! Of Holley's book cover! That's awesome!